With just a few weeks until my Beltherway trip, I am spending a lot of time trying to get organized. That involves not just making final itinerary plans, but also making a checklist for packing and pre‐trip preparations — things like remembering to stop mail delivery, turn down the heat, and notify my credit card issuer of my plans. So I did some hunting, and I found an app called Planapple. This app does everything I need, is easy to set up and customize, includes a browser extension that installs a little button I can use to add something from the Internet to my trip, and also supports forwarding those booking emails (though I never use that feature). 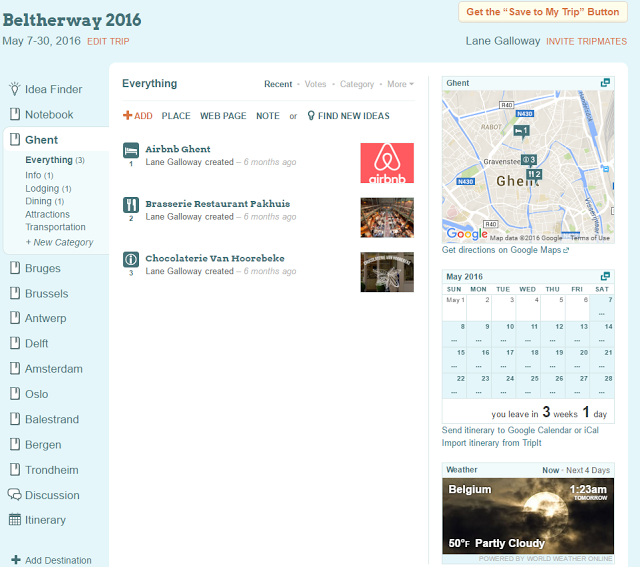 You can even import your TripIt itinerary. My favorite thing about Planapple, as compared to TripIt, is that you can set up trip segments and then add ideas, notes, links, whatever, to each segment. You can add any item to your itinerary, but you can add items that are not part of the itinerary, such as links to web sites with travel information. Here’s a screenshot from my upcoming trip. Along the left are the segments of my trip. 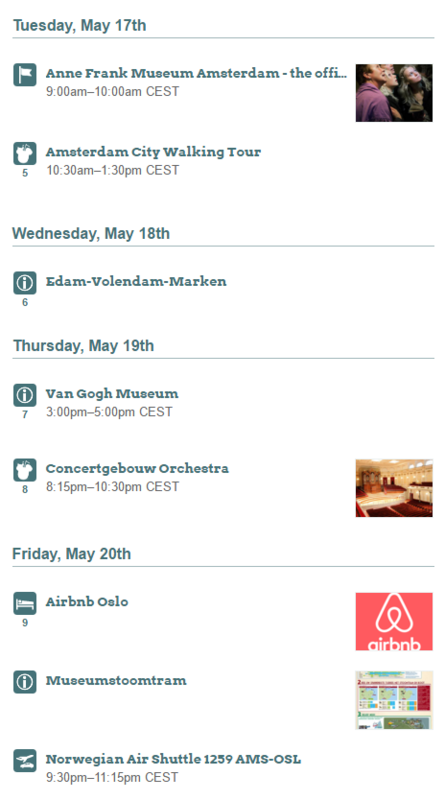 Right now I’m viewing everything I’ve posted for Ghent: my Airbnb, a restaurant that I read about, and a chocolate shop that was highly rated. The map and calendar on the right can both pop out for a detailed view. If I select “Itinerary” from the left menu, I see everything that I’ve actually scheduled. These are items I’ve added to my itinerary. Some are scheduled at specific times, others are just set to the date. This is all good for planning, but I’ll be using my cellphone to refer to all this information while I’m actually traveling. 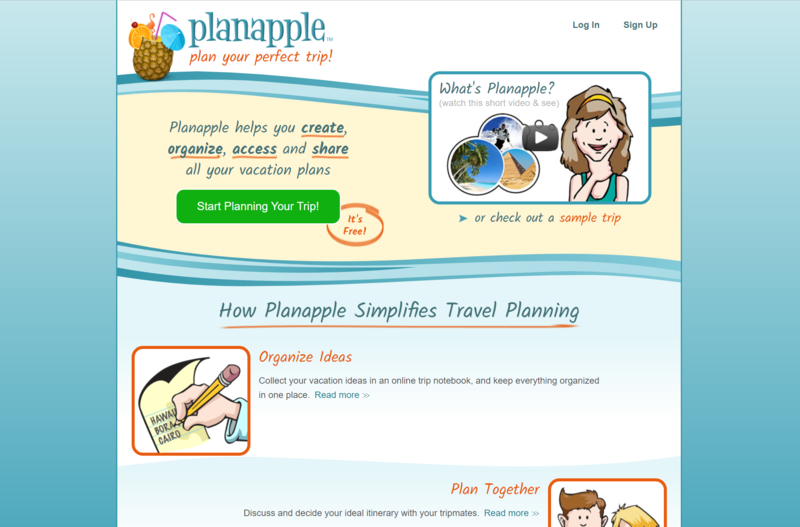 Planapple allows me to download the entire trip to my cellphone for offline use (while I’m not connected to the Internet), and it has a very useful mobile web site (not an app). 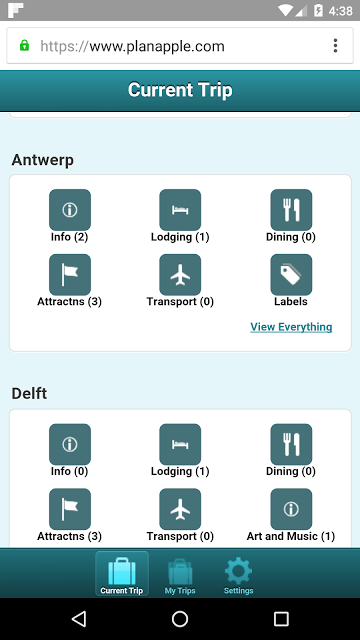 Now when I arrive in Delft, I’ll tap Lodging and I’ll see the information I entered about where I’m staying in Delft: address, directions, and contact information. When I tap the address, it opens Google Maps and I can get the route. Planapple also has a feature called Idea Finder to help plan. I haven’t ever used it, but it might come in handy sometime. 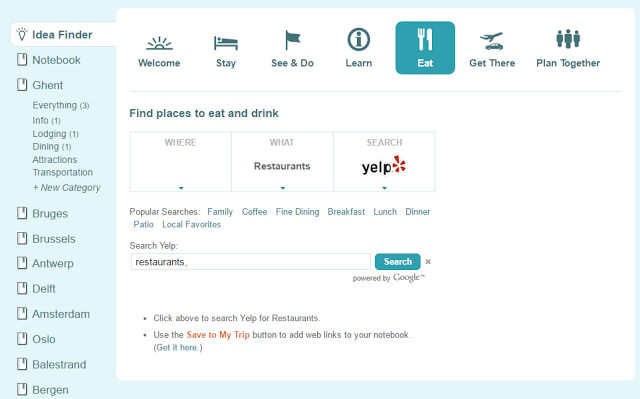 And it has some good features for collaboration, so you can post ideas and your travel partners can comment and vote. [Update, 4/16/2016] One of my concerns about Planapple is that it is the product of a couple of guys, it’s completely free (although there used to be annoying “please donate” popups, which you could get rid of by sending some money, which I did to get rid of them, and I don’t know if they still have them) and there are no ads. So I worry that they may just go away at some point. They have a product blog, but the last entry is from November 2014. However, as you’ve noticed, we haven’t been adding visible new features recently. Although Planapple has a dedicated set of users, it’s not big enough to support full‐time staff. We treat Planapple as a “hobby project” of sorts, and try to improve it when we can nights and weekends. There’s actually quite a lot of behind the scenes work that goes into keeping the site running and updated with the latest security fixes, browser changes, etc. But it’s not the sort of thing we can blog about, and unfortunately, it means we’re not able to add new features as quickly as we (or you) would like. That said, I have been working on some major improvements for tablets and phones, as well as larger screens. I don’t want to guess at a date (because I don’t know what more‐pressing issues may arise in the meantime), but the product is definitely not dead. I hope that helps explain Planapple’s status. Thanks for supporting Planapple, and enjoy your travels!